ITP has taken the outstanding features and benefits of its highly successful SS Alloy utility wheel line and applied them to the high-performance ATV market with the release of the all new SS112 Sport. The one-piece aluminum SS112 Sport wheel uses a bright, diamond-cut machined surface with black accents, all topped with a tough clear coat finish. Like all SS Alloy wheels, a custom SS wheel cap is included. The SS112 Sport wheel is available in 10x5 front and 9x8 or 10x8 rear sizes for most of today's popular sport quads. - ITP ATV wheels are sold individually. 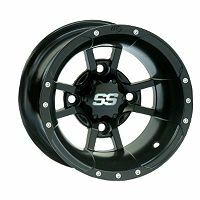 - The SS112 Sport ATV wheels are available in machined, black, and chrome. - These one-piece cast aluminum atv wheels are lightweight yet strong enough to handle any type of off-road terrain. - All SS 112 ATV Wheels include a center cap and lug nuts. - All ITP ATV Wheels are covered by a lifetime structural warranty. I ordered these ITP wheels to replace to stock wheels on my son's Can-Am DS250. I researched many websites and found Pure Offroad to have the most affordable price. After I placed my order via the internet, Pure Offroad processed and shipped the order very expeditiously. The boxes arrived in just a few days with no damage. I would definitely recommend Pure Offroad to anyone looking for quality parts and accessories at a an affordable price. Keep up the good work! Q: What size will fit my 2014 Kawasaki 300 brute force? A: If you are wanting to keep the stock 10 inch size we do not have any that will fit. If you want to upgrade to 12 inch wheels we should have some options for you. Let us know. Q: Are these rims the same size as the original 10" steel wheels that are on a 2018 Kawasaki Mule SX 4x4? I'd like to change out the factory rims but keep the original tires? A: Unfortunately these do not fit your Mule. We just carry the plain steel wheels to fit your model. Look up part number ITPSWBS on our website.